Isn't it a bit sad how dependent we are on the internet? I never really notice it until the precious life-blood of blogging is ripped away from me. I won't have any regular access to internet in the new BT headquarters until *next* Saturday, which I'm trying to pretend isn't seriously effecting my daily life. I've been doing my best to keep up with everything, but I'll warn you now if you send e-mails or comments my way, there may be delays (even longer than usual!). I didn't want to go, however, with yet another week of silence here induced by the absence of any connection to the outside world - so I'm taking another quick opportunity to update you on what's goin' down. That week-long cold snap at the end of August was such a treat. And such a tease. It was all I needed to get my Fall gears turning. Of course September so far has been relentlessly hot and humid and I'm feeling a bit of remorse for letting myself indulge in that early Autumnal preview. Either way, I started the first of hopefully several Fall Sweaters and I'm not ashamed of that. It's a seamless cardigan in one of my favorite tweeds (the same I used for this - it's definitely good enough for multiple sweater projects) that I'm designing as I go. It's a beautiful yarn, isn't it? I've also been collecting sufficient stock for the spinning machine to keep a-whirrin' through the season. The most recent acquisition looks a bit like frosting to me, but maybe that's the sleep deprivation talking. I don't think I've mentioned it earlier, but I am officially a full-time student again. I started a 2 year MFA program this past week. To say I'm overwhelmed is a bit of an understatement, but it's all very good. 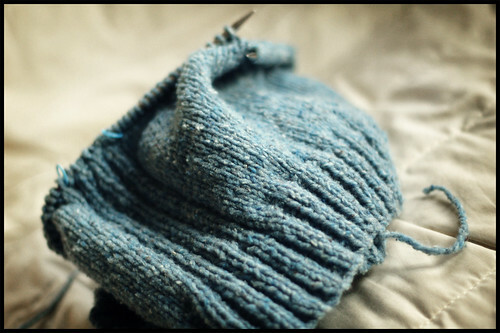 And I'm keeping my fingers (and toes) crossed that I'll be able to keep knitting as much as my sanity requires. Which is a lot. The BSJ is done and just needs buttons. More to come on that in the near future. thanks for responding to my email so quickly! I want to say that I think your pictures display the beauty of those yarns so well. I'm sure that you cause a lot of business for the yarns that you use! question for you. how do you think the tweed in this post would stack up against the Classic Elite Skye Tweed used in your Cobblestone Pullover? I agree about lack of internet access. I was without my pc for two whole weeks recently and I felt awful; I had to keep reminding myself that it wasn't that bad, nobody had died. But once you're connected again, it will be as if this terrible time never was, honestly. That Beaverslide Blue is the colour of heaven. If you're worried about knitting time while you're at school, you could be a complete dork like me and knit through classes. Somehow it keeps me paying attention to what's going on around me. However, bringing larger projects to a classroom can be somewhat difficult . . .
Can't wait to see how the sweater turns out. And the student thing is really a good thing. You can always knit in class! Imagine all the extra knitting time you'll get! I was going to ask the same question as the red hot did, above... the Beaverslide is gorgeous, so how would it do in the Cobblestone pattern? What a nice blue you're using, can't wait to see more! We love the blue in the cardi - such fine knitting too ! It's amazing how much the Internet has taken over our lives. For us, because we are tiny and can only go places when taken, the Internet is our world basically ! Should see Mum when we first moved to our new place. We have to wait like 2 weeks before our broadband was connected up again. She was having serious withdrawal and she kept annoying us both ! A whole 'nother week! How are we supposed to get along without BT? Oh well, I guess we'll have to take a cue from you and knit through the trauma. Good luck with school; that MFA will be worth the effort. Good for you for going for your MFA; it's all worth it. You'll have fun! Yes, a bit of work, but who cares? And you might try knitting in class.. it really does help me stay awake, and I CAN knit and pay attention at the same time! No internet access??!! Oh, bummer! I know how bad it is when I can't get to my puter! I wouldn't want that wished on anyone! But the good thing is that you might find some net cafes, or the library, or even a friend/neighbour who will let you "just check my emals"; you need to get your regular fix, I know! But you do have some nice stuff to ease the loneliness! I enjoy reding your blog as it is one of my favorite daily reads. Good luck with being a full time student! very nice! i like this color a lot. what are you getting your MFA in? I've been thinking about you and your move and travels and back-to-school stuff. Looks like neither of us will be getting much sleep soon, eh? At least at this point in the school year the supplies are all shiny and new. I'll look to you to inspire me to keep up the posting once the little guy arrives! I'm sure the knitting will be a welcome break from the studying. What are you getting an MFA in? I got one a few years ago. It was a ton of work but totally worth it. And i loved every moment. Congratulations on going back to school! I considered getting an MFA (I have a BFA in printmaking) but ultimately decided not to, partly for financial reasons, partly because I don't like teaching. I am delurking...Congratulations on going back to school for your MFA! Best of luck to you! 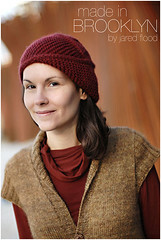 I just started Cobblestone Pullover and am loving it. I found that I had to go down a few needles sizes to get gauge and the fabric seems pretty dense. Is this correct? hey there jared. so glad to hear school is going well so far. i am feeling very similarly over here... overwhelmed but *good*. very very happy to be back in school :) and getting a surprisingly huge amount of knitting done while i read... cobblestone nears completion! congratulations and good luck in grad school! how exciting! I'm sooo jealous, I dream of going back to school... I can definitely see you as a "master" of fine arts. You have such a keen eye for the beautiful. Congratulations. Beaverslide seems so very lovely, but I've never had a chance to see it in person. I hope they have a booth at Rhinebeck. 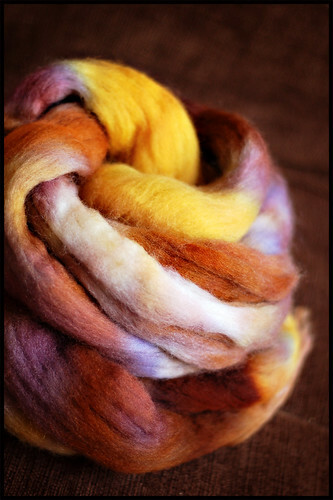 And the colours of that fiber!!! Can't wait to see you spin it into luscious yarn. that beaverslide is amazing. how would you rate the softness?? that color is so me!!! As many others have said, your blog and your pictures are a real treat for me, and I get a lot of inspiration from your projects. (Or should I just say that I copy some of your projects?). I'll echo what Stacey asked -- how soft is the Beaverslide, compared to, say, Rowan? the prices seem reasonable. I'd never even heard of Beaverslide until I checked your blog the other day. Now I've ordered enough for two sweaters! Congrats on your return to school! I just began my part time MBA this week, so I hope both of us can find time for the knitting to go along with the homework. I adore that tweed. Then again, I'm a sucker for tweed any day. Why is it that you could take a picture of a rock and make it look artistic. Everything you photograph is inspiring. I love the color of that beautiful tweedy yarn. It looks so nice. Good luck with your studies too. OK, you can go back to school as long as you keep supplying us with the knitterly goods! I too am working (uh, swatching and mathing) on a Beaverslide sweater edged with 2x2 ribbing that continues up each side of a stockinette body. Imagine my surprise when I check on BT and there it is! (Albeit in a different, but gorgeous, color.) Looks like yours is gonna be fantastic as usual. Condolences on the no internet thing too btw. That's gonna be one awesome sweater, homie. Congrats on school! I started my MFA program last week as well. I'm sure we'll find knitting time hidden between classes and studio hours somewhere. I disagree. I am grateful for the internet because it has introduced me to the wonderful community of online knitters. I was pretty much working in (bored/boring) isolation until I discovered, first, Steph's blog and, through her, yours and others. You folks have really expanded my horizons. I only ever knit sweaters and now I've done lace, socks, you name it. Congratulations on going to grad school. I have a BFA and have considered applying for a MFA off and on. Perhaps one of these days. I really enjoyed getting my MFA. All that time to focus on your work and ideas. You may not have as much time to knit but there is always the subway. I feel you. I just started a graduate program, too. MM not MFA (That's master of music for all you not fluent in academia) and I'm feeling the burn, but it's a lovely kind of burn.... Except the one that's taken up residence between my shoulder blades. That one's not so good... I hope we both find a way to keep learning and knitting at the same time! That is such a beautiful blue. Thanks for sharing. In this knitter's humble opinion you're already a MFA - but it will be nice to have it on some frameable parchment...good for you! Thank goodness you're already well entrentched in the philosophy of Knitting as Theraphy, it will come in handy. I hope you are going for an MFA in Fibers!! Im in the SCAD Fibers program and its amazing. You have a great eye and obviously a lot of talent, you will surely do well in your program. Good luck! Good luck in school! I'm working on my BS in Natural Science & Education:) I've been reading your blog for almost a year and I wanted to wish you luck. I also wanted to tell you that I love, (love isn't even the right word, it's more like love x 10000000) LOVE the pictures you take. 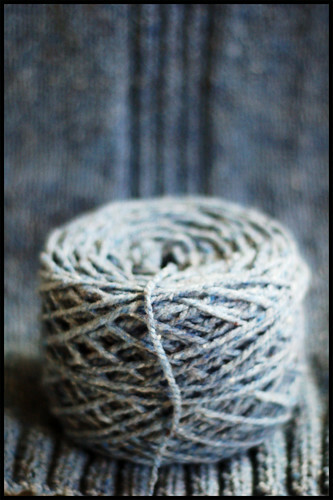 The wallpaper on my computer is almost always a picture you have take of your yarn. I just thought I would poke my head out of the woodwork, wish you luck and let you know that I deeply and extremely appreciate the time you take to take pictures of yarn. I'm going to try and do the Cobblestone in the Beaverslide McTaggart Tweed (Oat Straw). It's almost a bit too big (the gauge) but I think it will work. I'm saying this without reading through the entire pattern, but I'm being optimistic. 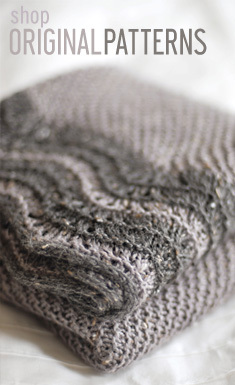 Simple, sturdy, soft, grey wools. There can never be too much of that. I just met a woman (fbz) the other day who pointed to her camera and said, "He uses this one," when I said, "You know who has the best pictures?" She also showed me the lens she thinks you use. Time for a new camera for me. We are so dependent on the internet, sometimes I wonder what it would be like without all this technology (I remember how it was and that in itself is scary). The tweed yarn is lovely. We had the some but opposite in August, some very nice warm days, I ditched the winter cardigan I was knitting and started on a summer cotton top, only for it not to last and we are now having hopefully the last of the cold weather. Sprin is so nice here. Both internet pluses and minuses - demanding and instant - but the plus is the connectedness (especially for someone in rural Australia) to the rest of the world - and the blogfriends you make. And the patterns. And the yarn you can get your paws on. And the friends you make. And the blogs. And the friends. Bad is the dependency and feeling so disconnected when it's not working!- Good luck with the study. your blog is really fabulous, one takes much pleasure to traverse it. I launch out for the hemlock boxing ring, as soon as I finish discussing me with the translation. If it you plaid, forgives me for my English, I do not practise it and I is useful itself of a software of translation. seems like you're still lacking internet time... hope everything is going well. The Beaverslide looks so lucious. I wore my Cobblestone to the Oregon Flock and Fiber Fest this weekend and got lots of wonderful comments- thanks again for the great design! Put those books down and write! Love your blog and unique work. I was referred to your site by a friend to knit with. loved browsing your site. I'm lovin' all those sweaters! and hats!